Eva Etzioni-Halevy's novel opens with two women, each of whom scan the horizon for the return of their men from battle. Both women know that their men must be the victor – only they are on opposite sides. Asherah searches for Sisra, her new husband who has been sent to defeat the Israelites, while Deborah, watches for Barak, the warrior she has chosen to lead the army to defeat Canaan. Barak returns in triumph with Asherah and Nogah, two daughters of the Canaanite King as his captives, though one is a princess and the other a slave. 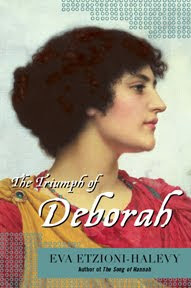 Deborah, despite her undying loyalty to the husband who rejected her, forms an affinity for Barak. However the two princesses have their own feelings towards the warrior who captured them. Asherah, Sisra’s widow, who recoils from any feelings that develop between her and the man who killed her husband. Nogah, whose mother was an Israelite slave, feels gratitude when Barak saves her mother’s life, but is still conflicted with what is expected of her. Barak himself is more concerned with his warrior role than the feelings of women, who are a frangible and a temporary part of his life, but these three, with Deborah as a fourth element, form a web of betrayal and jealousy. His casual treatment of all his women, Deborah amongst them, was a surprising element, the way he uses the two princesses for his own pleasure and forces Asherah to marry him, and yet they all still want him. Despite being forcibly divorced, Deborah's husband and father of her five sons expects her to keep her marriage vows. She has to balance her growing feelings for Barak and her self respect in the role as Prophetess of the Israelites and a judge revered by her people. Feminine but powerful, her independence shows through as she takes her people into war. Written in omniscient point of view, this novel draws a colourful picture of life in ancient times, from palaces, to marriage rituals, the status of princesses and slaves alike, and how men behaved toward both. The battle scenes are of epic proportions, where Barak’s horror on the battlefield is well portrayed as the dead and dying pile up before his eyes. Eva Etzioni-Halevy’s other biblical novels are, The Song of Hannah and The Garden of Ruth, and she is working on a fourth.